iRacingTV provides an inside look at the PEAK Stock Car Dream Challenge 2.
iRacingTV takes you behind the scenes as we build and prepare the BMW Z4 GT3 racecar for the iRacing service. Go behind the scenes and see how our engineers put together the world-famous Circuit of the Americas! In August 2013, iRacing.com hosted the very first member All Star race pitting the best oval racers against the best road racers in service. The iRacingTV guys caught up with Ron Capps at New England Dragway in Epping, NH, USA this summer during an NHRA national event. 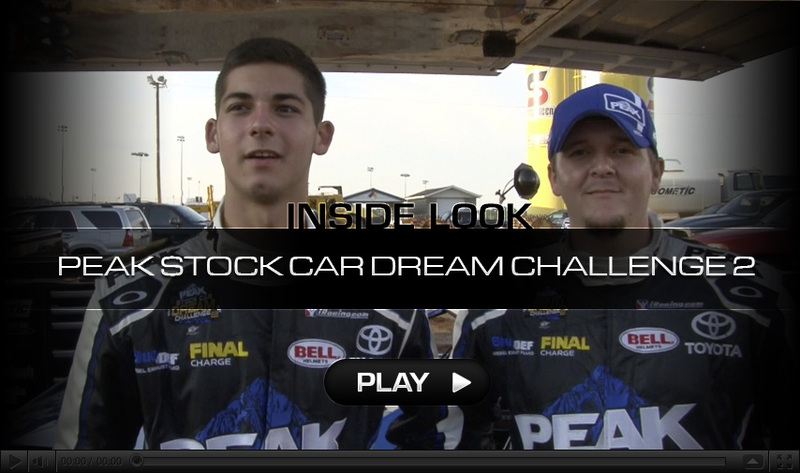 Enjoy a behind-the-scenes look at the series filmed during the first-ever V8 Supercar race in the United States. Steve Myers captures the camera and heads to Las Vegas for a trip to Bally Technologies, then to a real Ferrari racing experience, and ends with the 2012 NASCAR Sprint Cup banquet and then he races a real off road racing truck. Steve Myers captures the camera and heads to Las Vegas for a trip to Bally Technologies, then to a real Ferrari racing experience, and ends with the 2012 NASCAR Sprint Cup banquet and then he races a real off road racing truck. We begin with a Lotus 49 preview. Next, iRacingTV catches up with Ray Alfalla. New build features. 2012 Pro Race of Champions recap. Richard Jobling discusses his latest projects. The episode ends with a short Garage Talk. Check out this episode featuring the entire 2012 iRacing World Championship Grand Prix Series Season! Find out who wins the biggest prize of $10,500 in the sim racing world! The latest build news from the last major software upgrade, Lime Rock Park to watch Kevin Bobbitt perform a few pit stops, & an update from our friends at SimCraft. Check out this special episode covering the entire 2012 NASCAR iRacing.com World Championship season. On this episode of iRacingTV you will travel with the crew to New Hampshire to meet foudner of TradingPaints.com, Steve Luvender. Also, the crew travels to Montreal Canada to scan Circuit Gille Villeneuve. Travis Pastrana joins iRacingTV for a special episode! Check out the official Nitro Circus 3D movie trailer here along with exclusive footage from the movie that you can't find anywhere else! iRacingTV is back with another episode to bring you up to speed on all things iRacing! This episode features an update from iRacing president, Tony Gardner on recent developments and future projects. iRacingTV begins 2012 with episode 12! Watch to learn about the latest iRacing news including: a new racecar mention, new features being built for future software builds, and interviews with Ray Alfalla and Yang Ou. In the eleventh episode of iRacingTV, VP of Art & Production, Greg Hill, reviews up and coming features. Also, NASCAR iRacing Series World Championship driver Josh Parker stops by the studio to discuss his sim racing career. In preparation for the Mobil 1 Tony Stewart/Lewis Hamilton seat swap event at Watkins Glen, Tony used iRacing sim software to prepare. The 3 Wide Life television crew was there to capture every exciting moment. This is the first episode of the iRacing Sim Racing World Championship Magazine. In this episode we review the NASCAR iRacing.com Series World Championship, the iRacing.com Drivers World Championship Series. Get a sneak peek at Heat Racing and other upcoming content. Pro Racers visit iRacing.com headquarters. We also cover the 2nd iRacing Virtual Indy 500. Plus, watch our new How To on Spectating and Ghost Racing. We preview of the upcoming build, and our new podcast "iRacing.com Sim Racing World Championship Magazine". We cover PAX East, and interview Landon Cassill. Tony Stewart test drives the sim. Get a behind the scenes look at the upcoming Ford GT, Okayama and Suzuka tracks. Get tips on planning your iRacing career, and watch an interview with Dave Kaemmer on the ongoing tire model project. Happy New Year! In this episode, Tony Gardner discusses highlights over the past year. Get a sneak peek at what's to come in 2011 and beyond. Also includes exclusive "How To's" covering fixed setups and more. Watch as iRacing member Greger Huttu takes what he learned using the iRacing Simulator to the real world race track in this iRacing TV Special Episode. Exclusive new car and track previews. Also get the latest updates from the upcoming 2011 iRacing Drivers World Championship. Plus, Richard Towler is awarded in Homestead Florida. Sean Siff and Kevin Bobbitt cover the latest build news, and recap the iRacing Drivers World Championship and the final NASCAR iRacing Series World Championship. Also features exclusive guided setup tutorials. Watch a new Williams FW31 Video. Includes a recap of the NASCAR iRacing Series World Championship, iRacing Drivers World Cup Road Racing, and other races. Also features a new segment called "How To". iRacing's V.P of Art and Production, Greg Hill, describes the track building process from on-site laser scanning to placing each tree and object on or near the track surface. Sean Siff interviews several TDI Cup drivers, and David Phillips gives updates from inRacingNews. Also includes recaps and highlights from recent iDWC and other races. Includes a first look at the Williams FW31 car. iRacing president Tony Gardner talks about next season�s build. We also cover several iRacing series including the NASCAR Drivers World Championship and the Drivers World Championship Road Series. iRacingTV is your monthly webcast covering all things iRacing. A collaboration between the iRacing staff and community members, iRacingTV provides valuable insight into the happenings of iRacing. You will hear from iRacing insiders like Tony Gardner, president of iRacing, Steve Myers, executive producer of iRacing, Dave Kaemmer, co-founder and CTO of iRacing as well as other staff members offering behind the scenes access to iRacing.com. Learn what�s in the works for iRacing and watch some great racing footage from various iRacing series provided by members of our community. New episodes of iRacingTV are scheduled for every month so check often for the latest iRacing news. You can also subscribe to iRacingTV�s RSS feed or podcast and automatically receive notifications when new episodes are available. If you have ideas or content you want to share, email iRacingTV@iracing.com with your suggestions � we would love to hear from you! Special thanks to Florian Godard for producing each episode as well as the many members of the iRacing community who contribute to iRacingTV each month.